Looking to add that extra bit of fun to mealtime? Try Bounty Quilted Napkins with colorful Prints! Strong enough for the toughest foods, Bounty Napkins are the perfect addition to any lunchbox, dinner table, or even a party! 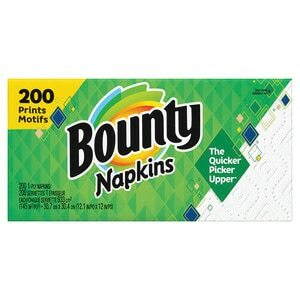 And since Bounty Napkins are 2X stronger*, just one will hold up for the whole meal. *when wet vs. the leading brand. Pack contains 200 count printed napkins. 2X stronger (when wet vs. leading brand). Each pack contains a selection of decorative print designs that are sure to complement any room in the house; No matter what print design arrives, it will be sure to delight the family! Also try Bounty Paper towels in decorative Print Designs.